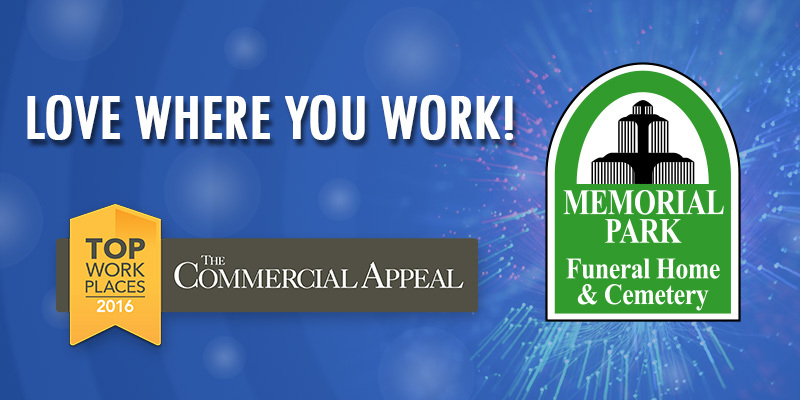 Memorial Park Funeral Home & Cemetery in Memphis, TN, was selected by The Commercial Appeal in their top 2016 workplaces in Memphis, TN. This is the first year Memorial Park won this award. “We are blessed with a highly professional, highly engaged staff and it shows. A lot of hard work by a lot of people revitalized our culture and made this award possible. Our management team thanks the entire staff for the great work they do every day to make sure that we are one big family serving other families!” mentioned Richard Williams, General Manager of Memorial Park. What makes Memorial Park such a great company to work for in Memphis? Its employees voted and, among many reasons, stated that Memorial Park gives each of their employees up to $2,000 towards their health savings account for medical expenses. To help their employees save more, they also provide wellness incentives that helps cut monthly insurance premiums up to $160. Every year, Memorial Park donates to charities and sponsors local organizations. This year included hosting the annual Fallen Heroes event; sponsoring the annual 5K for Camp Good Grief; and sponsoring the Ride for Life for the Mid-South Transplant Foundation. Memorial Park continues to be a major sponsor of the Tournament of Hope celebrity golf tournament fundraiser for cancer support groups. Visit Memorial Park’s website to learn more about their services, what makes them an excellent place to have your career, and view their upcoming events. Also stop by The Commercial Appeal, Memphis’ local source for breaking news and part of the USA Today network, for the full list of top workplaces in Memphis, TN for 2016.